The basis for this dish is a cruciferous vegetable like cabbage, broccoli, brussels spouts, or cauliflower. Tonight I used red cabbage. Before you get your underthings in a snit, no, this is neither a preachy piece about veganism, nor is it the germ of this becoming a food blog. It is a response to a conversation I had this week with a coworker who is trying to lose weight in a healthy fashion. I recited this recipe to him, but I thought both he and my readers might like to have it in writing. On background, I developed this dish many years ago when I was single. I wanted to cook at home, since I despise sitting in restaurants alone. I learned some cooking ideas from Scott, who was, at the time, a vegetarian. He liked to stir-fry a lot. A fresh cruciferous vegetable. 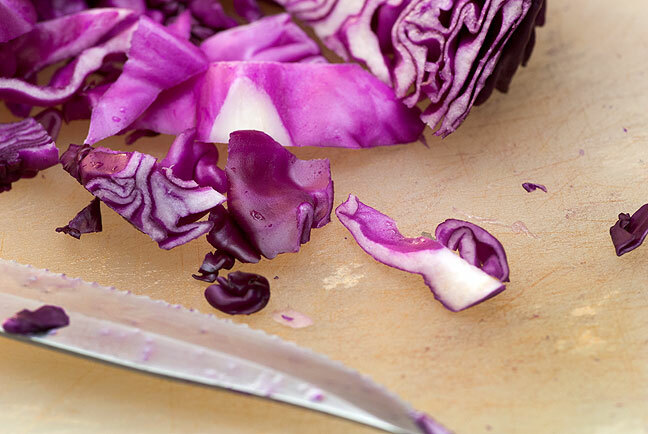 Red cabbage or broccoli are my favorites. A vegetable of a different color. In this case I used carrots, but various colors of bell pepper work well. Onion. I put some chopped onion in all my stir fry dishes. A protein. Since this is vegan, in this case I used dry roasted, unsalted peanuts, but tempeh and tofu work pretty well, as would unsalted cashews or walnuts. Brown rice. White rice is pretty much just one step from refined sugar. You can also get some very nice whole grain rice blends. Flavor stuff: fresh garlic, fresh ground pepper, red wine, and a good soy sauce, like you get at the asian market. Start cooking the rice. While you are doing that, chop up your vegetables. How much is up to you. Don’t worry too much about making too much, because it reheats quite nicely. In a large wok or skillet, heat enough olive or peanut oil to coat the surface, then throw in the vegetables. Add the fresh garlic now if you have it. Cook them on high until they start to soften and the color becomes brighter. Add the nuts or other protein. Continue to stir and fry, which is how you stir fry. The whole cooking process only takes a few minutes. 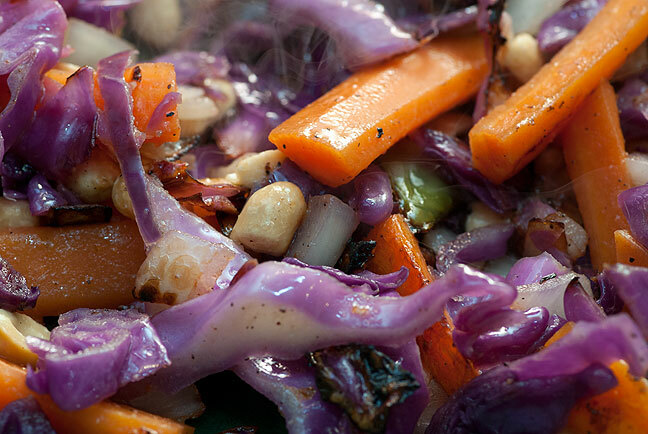 Overcooking makes the vegetables soft and bland. Near the end, grind in some pepper and throw in a splash of wine. Time this all so the stir fry will be ready at about the same time as the rice. When it’s all cooked, I simply throw it together and dash it with soy sauce. Don’t go overboard. Too much soy sauce can overwhelm the flavors, and is high in sodium. You will also note that in addition to being nutritious and delicious, it is also very affordable. For an extra special stir fry, put the entire contents in a tortilla, wrap with bacon, dip in cheese, and deep fry the whole thing! Near the end of the cooking process, a healthy stir fry should look like this: colorful, crisp, and healthy. If I could, I’d post a picture within this reply of giant red cabbage I bought recently, with the express purpose of making this very dish. “Peanuts and cabbage?” everyone says when I describe it, but I love it and hope Mr. Hammill will too. That’s similar to my favorite stir fry, except I use sesame oil and, instead of a fresh vegetable of a different color, I throw in a handful of frozen stir fry veggies (usually the sugar snap pea mix from Walmart). Oh, and I have never added a protein, but I think I’ll be trying some peanuts or cashews next time! I made this again yesterday and added two strips of leftover pre-cooked bacon. So good!